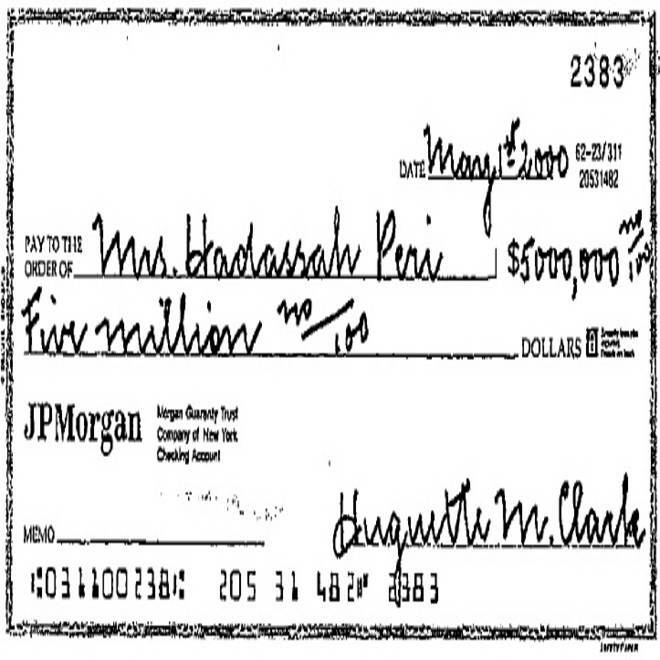 From the book "Empty Mansions"
One of three $5 million checks that Huguette Clark wrote to her private duty nurse, Hadassah Peri, who received more than $31 million, not counting millions more she could receive from the will. Hadassah worked for Huguette for 20 years, including every day for nearly a decade. She said, "I give my life to Madame." This is the third of three excerpts adapted from the new book "Empty Mansions: The Mysterious Life of Huguette Clark and the Spending of a Great American Fortune," by NBC News investigative reporter Bill Dedman and Paul Clark Newell, Jr.
Peri family, from the book "Empty Mansions"
Hadassah Peri, Huguette Clark's longtime day nurse, is due for another $30 million under Huguette's last will and testament. That would work out to about $15 million after taxes. The private nurse on the day shift, assigned randomly to Huguette Clark in the spring of 1991, was Hadassah Peri. She would work for her "Madame" for 20 years, becoming, it seems probable, the wealthiest registered nurse in the world. Hadassah and her family received more than $31 million in gifts while Huguette lived in the hospital. And after Huguette's death in 2011, the nurse is in the will for about another $30 million, or about $15 million after taxes. Doctors and nurses said Huguette at first was "extremely frightened" of new people. She refused most medical treatments unless Hadassah was there to hold her hand and talk calmingly. When they couldn’t reach Hadassah, the other nurses would sometimes pretend that they were talking with her on the phone, telling Huguette that Hadassah said it was time to check her blood pressure. "You have to convince her," explained Hadassah later. A small, compact woman with warm, dark eyes and black hair flecked with gray, Hadassah described patience as the key to her chemistry with Huguette. "You have to explain it to her, you have to educate her who is coming, what is that for — at times we have some difficulty." Hadassah worked for Huguette from 8 a.m. to 8 p.m., 12 hours a day, seven days a week, 52 weeks a year. She was up and out of the house before her children left for school and home close to bedtime. It would be several years before she took a day off. Hadassah was paid $30 an hour, $2,520 a week, $131,040 a year, but she described her self-sacrifice for Huguette as extreme. "I give my life to Madame," Hadassah said. Huguette’s first question in the morning would be "When is Hadassah coming?" She would call nearly every night to make sure Hadassah got home safely and to be reassured that Hadassah would be coming in the next day. Sometimes she’d call just as Hadassah got home, and the answering machine would pick up first. Here is a recording from about 2007, when Huguette was 101. Hadassah: Madame, I love you. Huguette: I love you, too. Good night to you. Hadassah: Have a good night. Huguette: Have a good night. Huguette: Will I see you tomorrow? Huguette: I love you, too. 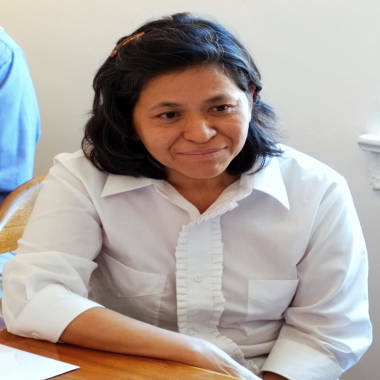 When she was assigned to this elderly patient, the immigrant from the Philippines lived with her husband, a taxi driver, and their three children in a small apartment in Brooklyn. Jonathan Sanger. Collection of Bill Dedman, from "Empty Mansions"
Huguette Clark bought six homes for her nurse, Hadassah Peri, part of more than $31 million in gifts over 20 years, including two apartments in this building on New York's Upper East Side, the Gatsby, on East 96th Street. Huguette bought them a $450,000 house after their apartment building had flood damage. Then $150,000 for a second apartment, and $775,000 for a house for Hadassah's brother's family to stay in. He never moved in, and the house has remained vacant ever since she bought it. Yes, Huguette’s nurse has her own empty mansion. The generosity continued: $885,000 for an apartment for Hadassah's children on the Upper East Side, then $1,475,097 for a second apartment. And, the last, $599,000 for a house on the New Jersey shore, so the family could take vacations together and so they would have a refuge in case of a terrorist attack, as Huguette had bought her own safe house in Connecticut. Huguette was generous to other employees as well, but the gifts to Hadassah accelerated. She paid for schooling for the three Peri children, from preschool through graduate school. She paid for their medical bills, piano lessons, violin lessons, summer camps. When the Peris had some trouble with back taxes, she paid for that. Huguette wrote more than 300 checks to Hadassah over the 20 years she was in the hospital. Three times she wrote personal checks for $5 million in her recognizable precise handwriting. "Sometimes I would say, 'You gave me a check already today,'" Hadassah said. "She would say, 'You have a lot of expense, you can use it.'" The Peris paid cash for a new 1998 Lincoln Navigator luxury SUV for $48,000, then a new 1999 Hummer for $91,000, and finally a new 2001 Bentley. And not just any Bentley, but an Arnage Le Mans, one of only 150 in the world, for which they paid $210,000 in cash. Hadassah said the Bentley was a burden. The fastest four-door sedan in the world wasn't a practical car in Brooklyn. Hadassah Peri, Huguette Clark's daytime private-duty registered nurse, describes the inconvenience of owning a Bentley. From her videotaped deposition testimony in the estate contest. Huguette's accountant and attorney say they were concerned that Huguette was vulnerable to the influence of people around her. But they said they didn't raise the question with her. "Certain questions were not asked of Mrs. Clark, or her motives questioned," said the attorney, Wallace "Wally" Bock. "She knew what she wanted to do, she made up her mind what to do, and normally you couldn’t change her mind anyhow, and she would get angry if you persisted." Besides, he said, he thought of Hadassah as loyal and devoted to Huguette, and it appeared Huguette was not being pestered for gifts, but would instead seize on any opportunity to be generous. "Her question was, 'Can I afford it?'" Bock said. "And I would say yes. I would say, 'But why don’t you put it into a will rather than giving it now?' And she said, 'I want to see people enjoy the gifts that I give while I’m alive.' Mrs. Clark was a very smart and astute woman who made up her own mind, decided what she wanted to do, when she wanted to do it. She didn’t ask permission." Hadassah said she never asked for any of these gifts. "For twenty years what do you do if you stay in the room? We always talk about our lives, we talk about anything, you know, and she always ask my family....I dedicate my life to Madame. For almost fourteen years I stayed more in Madame room than in my house. I work twelve hours. . . . My husband is a mother and father while I’m working with Madame. Family vacation, I miss, when the kids were growing up. Because she never wants me to take off. She is uncomfortable with other people. I gave my life for her." Hadassah was asked whether she questioned the ethics of accepting large gifts from her patient. In her testimony, Hadassah showed no hint of embarrassment or doubt, only entitlement, saying she didn’t know of any rules, and besides, she was an independent contractor, not a hospital employee. "I cannot recall any paper that I am not allowed to receive any such gift." What about the ethics of the nursing profession? "Never come to my mind." Learn more about "Empty Mansions." Previous excerpts and all of the NBC News stories on Huguette Clark are at http://nbcnews.com/clark/. The trial over Clark's $300 million fortune is scheduled to begin Tuesday, Sept. 17. Co-author Paul Newell, a cousin of Huguette Clark, is not involved in the legal contest.